"HostGator" Reviews (Apr 2019) - Why 4.5 Stars? HostGator, founded in 2002, has long been in the hosting industry. With more than 90% customer satisfaction and 12,000 servers under management, the company is one of the largest and most well-known web hosting brands. For customers whose sites grow to require extra power, HostGator offers scalability in the form of cloud, VPS, and dedicated server hosting options. “HostGator has been around for more than a decade and is well-respected for its large number of servers and consistent reliability. Known mostly as a shared hosting provider, HostGator still supplies decent dedicated and VPS options if you need your site to scale. “HostGator is a great compromise between performance and price. The company offers unlimited emails, MySQL databases, disk space, and bandwidth, plus one-click installs of popular open-source projects, in addition to a 99.9% uptime guarantee on its shared hosting plans. “Founded in 2002, HostGator is one of the largest web hosts with a long lineage of dedicated server hosting. With updated hardware, including Intel Xeon Quad-core processors and a boatload of RAM, HostGator balances performance, quality of service, and competitive pricing. “HostGator has built a great reputation in the industry for its shared hosting options. The company's VPS solutions, with optional cPanel support, provide a nice and easy introduction to those that are new to VPS hosting and know their needs require more than a typical shared server. 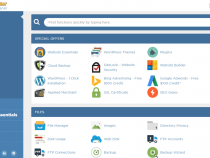 “HostGator is great for all things shared hosting, and application-specific services — such as the classic one-click-install WordPress hosting — are no exception. 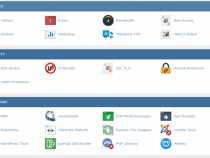 The team recently updated its already clean and intuitive cPanel dashboard, wherein users can find a myriad of free apps and scripts to install, including WordPress. You could quite realistically have a WP-powered site up and running in as little as an afternoon. “Setting itself apart from the scores of competitors that rely on white-labeled website builder solutions, HostGator spent the time to painstakingly craft its own platform. Gator provides a frustration-free experience that pairs the simplicity of drag-and-drop design with the company’s powerful and respected web hosting services. HostGator offers shared, dedicated, cloud, and VPS hosting, as well as domain registrations, a website builder, and reselling options. The crux of HostGator's services is its shared server hosting; this is what the company is known for and excels at. While focusing on the shared server segment of the market, HostGator has mastered what it takes to create a great customer experience, knowing the needs of the shared server client very well. HostGator's understanding of the shared hosting user makes the team the ideal guide to lead customers into the virtual and dedicated server world as they outgrow the shared space over time. There are a lot of freebies that HostGator throws in with each hosting plan, including: unlimited disk and bandwidth, a free website builder and website building tools, several hundred website templates, free domain transfers, and unlimited MySQL databases. Additionally, new site owners can call attention to their web property utilizing the $100 worth of Google AdWords credits, courtesy of the HostGator team. Enjoy access to hundreds of one-click installs available for all of the major open-source projects, such as WordPress, Joomla, and Magento. A 45-day money-back guarantee allows you ample time to try out HostGator and make sure the company's hosting can serve your needs. A 99.9% uptime guarantee is pretty standard for the web hosting industry and will cover most people's needs. If you need a higher uptime rate, you can find it, but it will cost you. 24/7/365 support is available via phone, chat, ticket system, and an online knowledgebase. HostGator uses the latest cPanel software to power customers' administration consoles. You can get rolling quickly, including tasks like organizing and launching eCommerce shopping carts. Using HostGator's backend account management panel, you can gather stats and logs using AWStats, Webalizer, Raw Log Manager, and Error Logs. Windows hosting customers can oversee their environments using Plesk for website management, email account creation, and software installations. 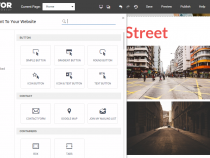 From a modern drag-and-drop website builder to the familiar cPanel interface, HostGator excels in providing a simple, yet powerful, user experience. The setup process is easy to get going with HostGator, given the company's quick provisioning system and clear icons. I found the experience to be straightforward, and when I had questions, I could easily start a live chat to get them answered quickly. HostGator's pricing is in the middle of the road when it comes to shared and VPS hosting. Good customer service and live chats cost money, and most good beginner web hosts fall in this range. With a 99.9% uptime guarantee HostGator performs admirably when it comes to reliability. This level of service is the industry standard and while there are hosts with a higher uptime rate, they also have a higher cost. HostGator has been in the industry for a long time, so you can feel safely assured that they are not a scam and will be around for the long term. Wondering how HostGator stacks up againt other web hosting services? See our host-vs-host reviews below and compare them side by side. 4 out of 26 times. HostGator is targeted toward beginners or those that are looking to host simple websites. They offer nice VPS and dedicated options to folks whose websites grow outgrow shared servers. Plus, HostGator's been around for over a decade and they have solid customer support available.